LawnAmerica Lawn Care franchise business opportunity. 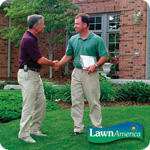 Free LawnAmerica Lawn business franchise information. Do you love working outdoors? Do you enjoy helping and serving people? If so, then you may be a great candidate for a LawnAmerica Franchise. We are looking for good, honest, hard-working people to be a part of our new and growing team of lawncare professionals. Our core services at LawnAmerica are fertilization and weed-control along with other lawn and landscaping services. We help make neighborhood more beautiful with our service, and give busy homeowners more free time to spend with their families and doing other things they really enjoy. We're very busy in the spring, but business remains consistent all year long in most areas. Lawncare is hard work, but it can be a fun and rewarding business. That is, if you know what you're doing! And that's where LawnAmerica can help--by teaching and supporting you as you start and grow your business in your hometown. Quick and Efficient Start-Up - Why re-invent the wheel? Our experience and support will help you get up and running without guessing and trying to figure things out yourself. Name Recognition with Trademarked Logo and Name - You'll spend thousands just on a logo and a name that will not have the clout and professional image of LawnAmerica if you tried to do it yourself. Purchasing Power - You'll save money on chemicals, supplies, software, uniforms, etc. with the purchasing power of LawnAmerica, especially as we grow larger with more business owners. Business Experience and Planning - With our 20 years of experience in building three separate lawncare businesses, we can help you avoid the pitfalls and plan for your future. With your input, we'll provide you with a detailed business plan each year and help you stay the course. Advertising and Marketing Expertise - You'll have professionally produced brochures, media spots, and all the marketing help and advice you'll need to grow your business, along with a professional website. Professional Equipment - You can lease a fully-equipped service vehicle, or you can purchase and equip it yourself with our specifications and advice. We know what the best types of equipment are to serve your customers, and have the contacts to provide that for you. On-going Help, Support, and Education - We'll not only educate you initially with classroom and field training, we'll continue to be available as each season progresses, by phone, e-mail, and in person. Camaraderie and Professional Relationships - It's often lonely being a business owner by yourself, unless you have peers that you can visit with, bounce ideas off, learn from, and sometimes just have fun with! As our LawnAmerica business owners increase, we will all learn and grow more from each other. There is power in numbers, and there is power in knowledge. Best Lawncare Value/Ground Floor <?xml:namespace prefix = st1 ns = "urn:schemas-microsoft-com:office:smarttags" />Opportunity - LawnAmerica makes it easier for you to be successful, with lower franchise fees and royalties compared to others. All successful franchises started somewhere. Could LawnAmerica be next? As in any new business, you will need some capital in order to start. However, this business can be started working out of your home, without a truck load of money. You can start small, and grow slowly from year to year as you build up your customer base. The estimated initial investment for a small-market franchise ranges from $33,900 - $45,000, with a minimum of $15,000 in cash. The estimated initial investment for a large-market franchise ranges from $41,900 - $58,000, with a minimum of $20,000 in cash. To learn more about the LawnAmerica Lawn Care franchise opportunity, simply complete the form below.